This is our stoutest draw bar Combo Hitch. The OMNI Combo Draw Bar Hitch transforms your tractor's 3 point draw bar into a universal trailer hitch platform. You can use your trailer hitches and accessories from your truck or auto receivers and have the option of adding any of our top mount accessories like the GN Ball, Tool Bed, Weight Rack or Lifting Boom. The 2" receiver hitch is a universally accepted method for trailer transport and many other trailer hitch items. The OMNI Draw Bar Hitch has a 3/8" x 5" x 3" angle that ties the hitch receiver and 3 point tower together into a very stable unit and bolts to your tractor's draw bar. 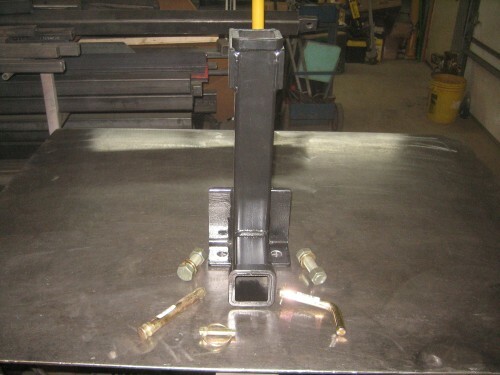 A 2 1/2" x 2 1/2"x 3/16" square tube reinforced trailer receiver is welded to the angle. There is also a reinforced 2" vertical receiver on the top. The top link ear tabs are 2 1/2" x 2 1/2" x 3/8. We also include two 3/4" bolts, nuts & lock washers, one 3/4" top link pin & lynch pin and one 5/8" bent trailer hitch pin & keeper. It is painted Kubota Orange. We have Cub Cadet Yellow, John Deere Green, IH Red, Ford Blue and dark implement gray also. This Auction Is for one OMNI Draw Bar Hitch ONLY. Any other OMNI Accessories shown are NOT included. You will need a Cat 1 or 2 draw bar with 2" on center holes to bolt it to. I recently received my combo hitch in JD Green (although it's going on a Ford 1320 tractor). The fabrication, fit, & finish were outstanding!! I recommend it, & Omni, highly. I just got my Heavy Duty Combo Draw Bar Trailer Hitch today UPS . I just mailed a check with a hand written order 9 days ago , so it came faster than expected . The quality & workmanship are first class , good looking welds & paint job . The fit to the draw bar was perfect , holes lined up & bolts fit tight with no play . All the hardware was included & fit . I do have a question , the top 2" receiver has a hole to accept a pin . One bent pin & clip is included & fits the bottom 2" receiver , that same pin will not go all the way threw on the top 2" receiver so that the clip or keeper pin can be attached . I thought that the one bent pin would be able to be used on either hitch , top or bottom , but it is too short to fit the top receiver . Is there a longer pin for the top or is it assumed that anything put into the top receiver would not come out anyway . Looking at pictures at the other combo accessories I saw no pin used in the top receiver , but there is a hole there for a pin . Thanks for a good product , I would recommend your company as a first choice . Thanks Note from Rock: The longer pin is included with any of our vertical mount accessories.